It is clear from these statistics that it is very important for websites to attain the first ranking on the first page of Google’s SERPs if they want to drive maximum traffic, leads, and conversions to their websites. By gaining access to your website’s rankings, impressions, clicks, & CTR metrics, you’ll know if your search engine visibility is expanding, and for what search terms and keywords. You’ll also know what keywords to optimize to improve your website’s rankings on the organic SERPs of major search engines. 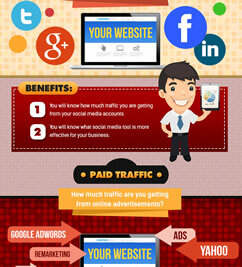 Do you know how much traffic your website is getting from external websites? Traffic coming to your website from external sources is known as referral traffic. External sources include blogs that are recommending your business by placing outgoing links from their blogs to your website; online directories you have listed your website on; national or regional news sites (as well as industry news sites) that have picked up your press releases or content, and have placed links in their stories to your website; and online forums that are talking about your business and linking to your website.